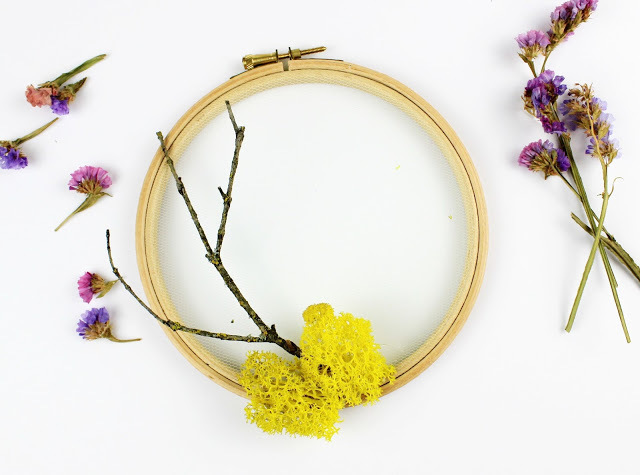 How to Craft a Woodland Wreath for Home Decor! 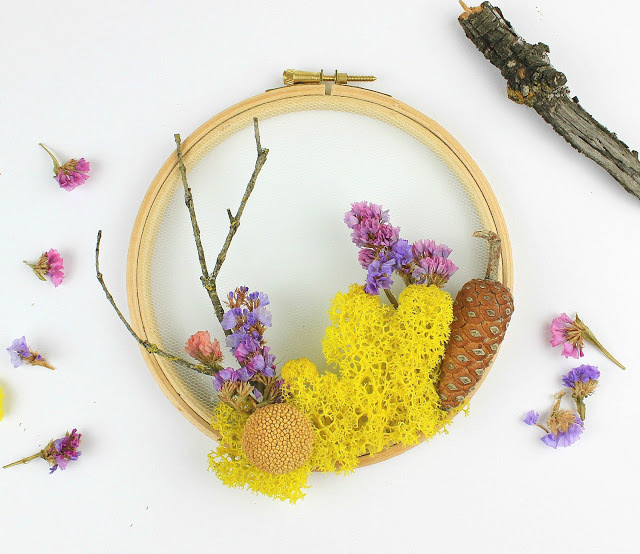 A craft with natural materials that anyone can find. Even thought I consider myself more like a Summer lady, I do love Autumn also, because of its colors! The Nature is the greatest artist this season and the natural paintings are mostly using colors like shades of green and brown and orange…my favorites actually. 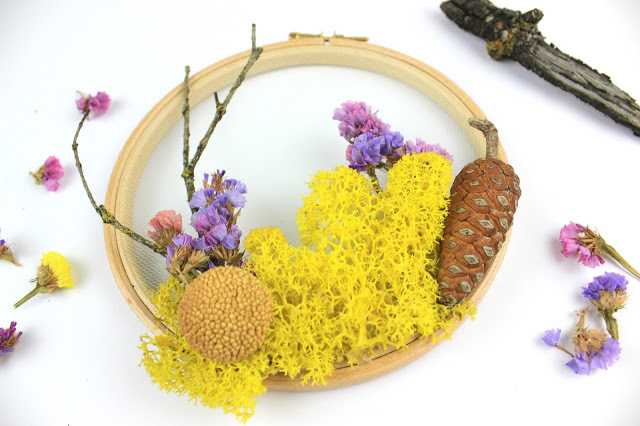 This is the greatest opportunity to create our own beautiful Wreath with flowers and natural materials that we can collect during a walk in the forest! Of course if you do not have a forest next to you, no worries. 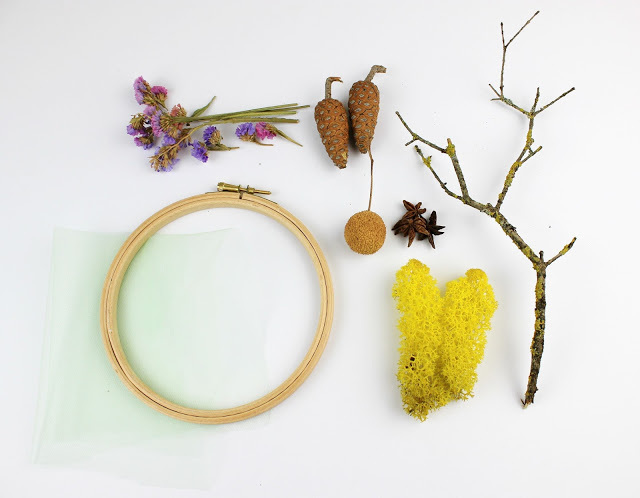 – Materials from the forest ( small branches, pine cones, moss, leaves etc) . Materials from any tree and from… spice’s store, since cinnamon ,cloves, star anise are more than welcome! The wreath is actually really easy to make it. It only needs 15 minutes and our imagination! 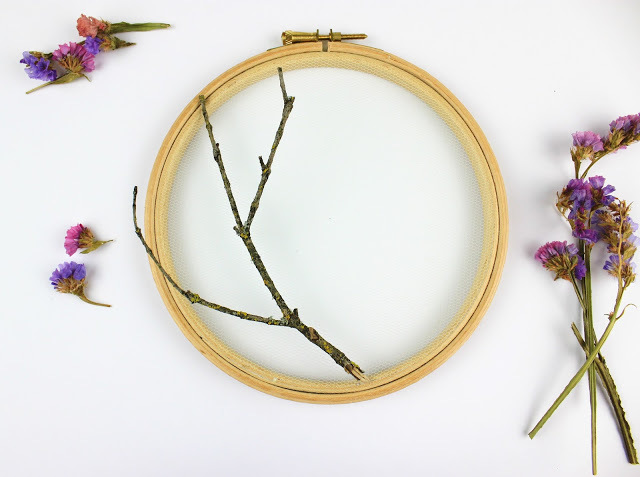 Firstly, put the tulle into the embroidery wooden hoob and close the hoop in order for the tulle to be stable. Put your materials on the tulle and start decorating it, until you decide how to combine them on yourw wreath. And then use hot glue to glue them on the tulle and the wood, if needed. In my wreath, as always, I wanted color, so my beloved dreid flowers were here. And our Handmade Woodland Wreath is ready! An easy and funny craft which actually is the perfect decoration idea for our home or to offer it as a gift! For Greek Post please enter here! Το αγαπώ, Ζίνα μου. Υπέροχο το στεφάνι σου. Εκπληκτική δημιουργία. Πολλά φιλιά, φίλη μου. Χαιρομαι που σου άρεσε Μία μου! Χίλια ευχαριστω! This wreath is so cute and cheerful! OH!!!! thank you very much! I am so glad you like it! Σου βγάζω το καπέλο! Κάνεις θαύματα με τα τελαράκια! Μπράβο κ πάλι μπράβο! Σε ευχαριστω πάρα πολύ Κατερινάκι!!! !